Retra doesn’t want to go to Ixion, the island of ever-night, ever-youth and never-sleep. Retra is a Seal – sealed minds, sealed community. She doesn’t crave parties and pleasure, experience and freedom. But her brother Joel left for Ixion two years ago, and Retra is determined to find him. Braving the intense pain of her obedience strip to escape the only home she’s ever known, Retra stows away on the barge that will take her to her brother. When she can’t find Joel, Retra finds herself drawn deeper into the intoxicating world of Ixion. Come to me, whispers a voice in her head. Who are the Ripers, the mysterious guardians of Ixion? What are the Night Creatures Retra can see in the shadows? And what happens to those who grow too old for Ixion? Retra will find that Ixion has its pleasures, but its secrets are deadly. Will friendship, and the creation of an eternal bond with a Riper, be enough to save her from the darkness? 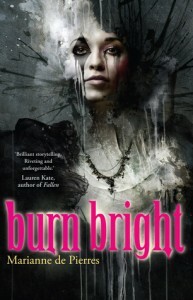 Burn Bright was an edge-of-your-seat thriller all the way through for me. I had trouble putting it down, reading with a sort of fascinated horror as Retra tried to make her way on the island of Ixion. Retra’s brother Joel ran away to the mysterious island of Ixion to get away from the repressive society in the Seal South community – where every interaction is strictly controlled. After his disappearance, Retra’s family is subjected to disruptive surveillance, and eventually she musters up her courage and breaks out of the compound, jumping the ship bound for Ixion. Ixion is a pleasure island of endless night, where all are young and uninhibited. They party around the clock, as on arrival their metabolism is altered to not require so much sleep. Retra immediately finds it difficult to fit in as a “Seal” and is terrified by the licentiousness of the other inhabitants, but she must steel herself and try to blend in as she tries to locate Joel. What she finds along the way is terrifying – just how much control do the Ripers have over the residents of Ixion, and where is it that the older people are “withdrawn” to? Just who can she trust in this strange new world? And who, or what, is whispering to Retra from the shadows? Burn Bright reminded me of the Divergent series to a certain extent – Retra must overcome her fears and step out of her comfort zone in order to move forward in this strange world, and she manages to hold onto her own identity just as Tris does in Divergent. The tone of the whole story is quite dark and creepy, and although there are occasional light-hearted moments the overwhelming feeling I got was that this was less of a party island and more of a haunted house ride at a theme park. I know there are plenty of young people out there in the world who would rather party night and day more than anything and I’ll be the first to admit I wasn’t one of them, so I was right there with Retra when she arrived, bewildered and slightly terrified on the island. The characters are amazingly imagined in this night world – I especially loved Retra’s friends Suki and Rollo and their interactions and the vampire-like Ripers are especially creepy despite many of them being described as “beautiful”. There is a bit of a love triangle in this first part of the trilogy but no real romantic scenes. The romantic aspect is possibly the only thing that I didn’t enjoy about this story – not the actual lack of romantic interactions but that Retra, despite coming from a tightly controlled community where she wasn’t even allowed to talk to any boys, is strongly attracted to several in a short space of time. It all seemed slightly too quick, but I’ll still be interested to see where it all goes after this. Marianne de Pierres usually writes hard sci-fi, but as her first foray into the Young Adult market I think she’s done very well with crafting this book to appeal to younger readers. 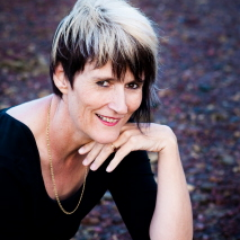 I’ll be reading some of her other works at some stage – I really enjoy her storytelling style. By the end of this first book in the trilogy there are still a lot of unanswered questions – I won’t spoil anything by listing them but let’s just say that I am really very keen to get my hands on the second book as soon as I get an opportunity! 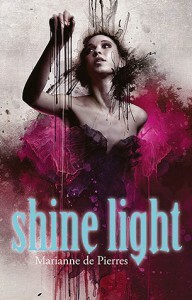 If you’re interested in a YA sci-fi with a dark twist, try Burn Bright! 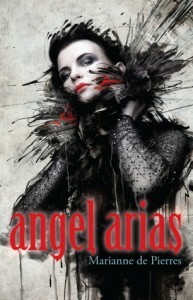 It is a good series Angelya, I am sure you will enjoy it! Shelleyrae recently posted..It’s Monday! What Are You Reading? It was partially your glowing reviews that convinced me to read this one, Shelleyrae 😉 The other part of the convincing was my Dad, who really enjoyed the series! I hope you enjoy it Tien! First, these covers are some of my favorite ever. Second, so glad that they are available in the US, finally! Third, I CANNOT wait to read these books. They sound amazing. I really enjoyed reading your review. I was not a party goer much in high school, and even now at 30, parties just aren’t my thing. But reading about an all day, all night, neverending party sounds fantastic. Live vicariously, and all! And even more than that, dark and creepy are two words that will always make me want to read a book ASAP! So, hopefully I can read this one, ASAP!! Thank you for your wonderful review! You should! I hope you enjoy it!